The rainy season is here and with it comes the possibility of water issues with your home. One of the smartest, low cost ways to protect your home is with eaves trough cleaning. It may seem like more of a nuisance and not such a necessity to some, but ignoring the issue can result in serious damage. Your eaves troughs are there to direct the water from the roof and away from the house. Damaged eaves troughs can cause water to leak down the walls and pool by the foundation of your home. This causes basement flooding, mold and mildew and staining of your homes walls. Over time it can lead to soffit and fascia rot as well as wiping out your landscaping. Years of neglect cause the eaves trough to pull away from the home or rust which can lead to damage to the roof – a very costly expense. In homes that are constructed of brick, continued water and debris from the overflowing gutters can cause a breakdown of the mortar and effervescence to build up on the inside of the brick wall. This leads to mold, mildew and rotting of inner wall materials such as insulation, plaster or drywall. This would mean mortar repair and sealing as well as inner wall replacement. A huge expense for you to pay when a thorough eaves trough cleaning twice a year can keep the damage and decay at bay. Cleaning out your eaves (or gutters) is a messy, time-consuming and somewhat risky job. It is not recommended that you take on the job yourself – especially for the elderly or for homes that are over one story. The results of a fall can be not only physically painful, but result in costly hospital bills. When it is time to tackle your eaves trough cleaning, calling in a professional will save you time and money in the long run. A professional knows just what to look for and how to clean out the eaves trough properly and effectively. A professional knows to look for all areas that could lead to or are already causing damage to your home. 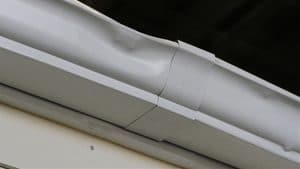 They have the proper equipment to handle second story eaves as well as the experience to spot issues such as cracks, separating joints and gutter rot. They have seen roof damage and soffit damage and will be able to make you aware of the issues so that you can have a proper repair done. Instead of idly standing by, watching the rain pour from your gutters like Niagara Falls, take the smart route and stop damage to your home before it starts. It is a small investment to make to keep your foundation solid, landscape intact, mold and mildew at bay as well as keeping you from possible injury and further repair costs. When done correctly, a thorough cleaning, inspection of the eaves trough, roof, eaves and drainage should take just a few hours. A few hours and a small price to pay is worth preventing costly damage and repairs in the future.